There are many ways to combine combo fields (multiselect or not) with system users. You can use it to allow dynamic task assignments once the process was already launched. Example: An employee needs the approval of his supervisor, but not all employees will have the same supervisor. So you can populate a combo field with the different supervisors and each employee will select the appropriate one. One way to populate the combo is to use Users or Roles as the data source. If the data source is Users, the combo options will be all users invited into Flokzu (regardless if they accepted the invitation or not). The user’s name and email address (E.g. John Doe <johndoe@gmail.com>). This option allows the combo to display the name in addition to the email. 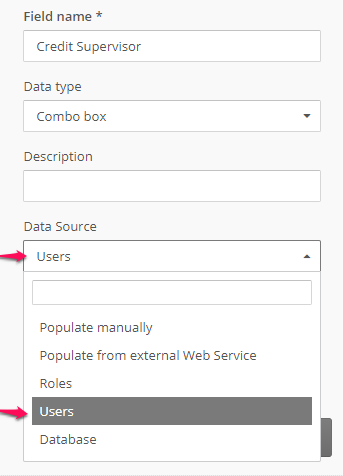 If the data source is Roles, the combo options will be all Roles created in the account (does not include default roles such as Administrator, Business Analyst and or All Users). If instead you want to include only some roles, select Manual as the data source and type the exact name of the desired roles into the combo value. Then you can use that combo box to assign tasks in your process or send automated mails.